One of the parting gifts we received from my brother-in-law from Vermont was a batch of spent grains from the Session Ale Brew that he and Scot made together during our visit. It took us until after we arrived in Maine to get moving on using them, and we’re sure glad that we did. Although there are so many things one can do with spent grains, I always think muffins first. And, as it is mid-September as I write from Maine, I wanted something a little more dense and filling as the weather turns cooler. Among the small variety of canned goods that I always have on hand is pure pumpkin puree. It is nutritious, makes for a good substitute for some of the fat in a recipe, adds a bit of body and flavor to whatever it is I am making and keeps it moist. 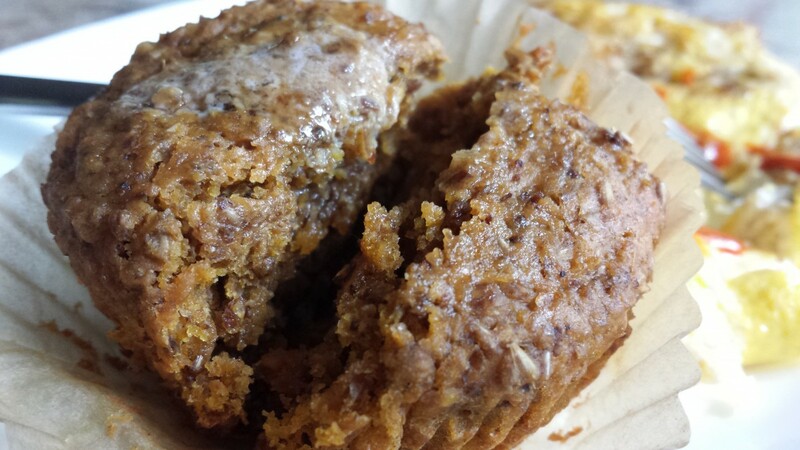 So it was an easy decision to combine spent grains and pumpkin for an autumn baked good. 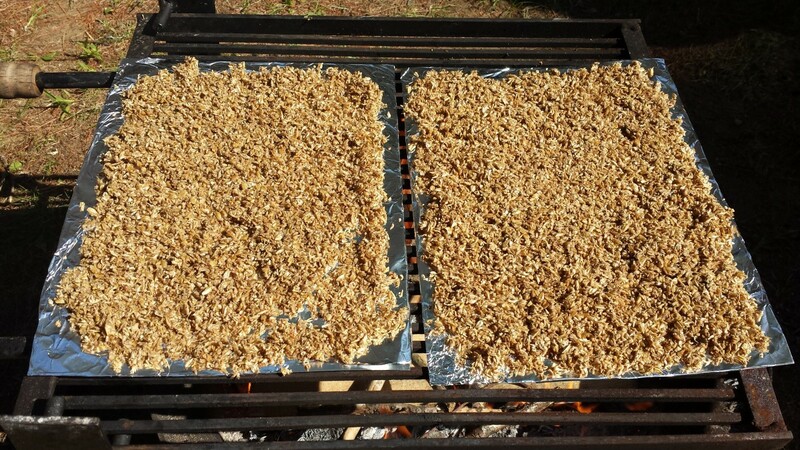 We just needed to dry the spent grains first. If you have ever dried anything aside from using a dehydrator — almond pulp, mushrooms, tomatoes, fruit — you know that it takes a really low and slow oven to do so. In our small camper kitchen, I wasn’t thrilled about using the little hot box we call our oven to make our tiny house into a slightly larger hot box for something like all day. In general, Scot and I have been finding ways to utilize our campfire more often for more than just grilling, such as for baking bread or muffins. Drying spent grains over a kind of low and slow open flame was a fun and easy test to see what else we can make outside. Scot built the fire and put the grate on top of it, and we both spent some time squeezing out the remaining liquid from the spent grains. We needed makeshift baking sheets, so I wrapped two reusable perforated aluminum grill sheets with a sheet of solid aluminum foil each and spread out the spent grains, placed them atop the fire and waited. 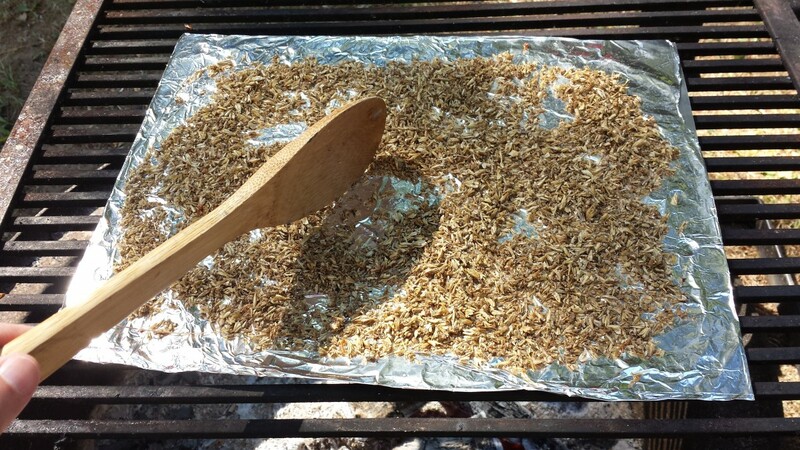 I was sure that drying spent grains on the campfire was going to take forever, or as long as it does in a low and slow oven, which often can take hours. To our surprise, at around two hundred twenty-five degrees, the spent grains dried in about an hour. It was amazing and fun and really easy. Afterward, we pulsed them into the smallest grains that we could using our hand wand. For finer flour-like consistency, a blender or food processor would be required (we left ours in storage). We are going to try to make it into flour with our mortar and pestle, just for kicks, and for pancakes. Damp Spent Grains atop the Fire. The Temp Roughly around 225 Degrees. Nevertheless, dried spent grains mixed into a pumpkin batter was basically effortless and fun, and very rewarding. In this case, as the the spent grains were used to make a lighter session ale, I tried to enhance them by using maple syrup, honey and pumpkin. 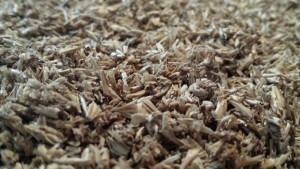 If I were using spent grains from a darker beer, I would use molasses, darker vanilla and even more beer, like a porter. 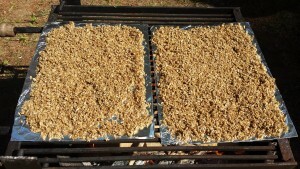 There are all kinds of things you can do with spent grain flavor. 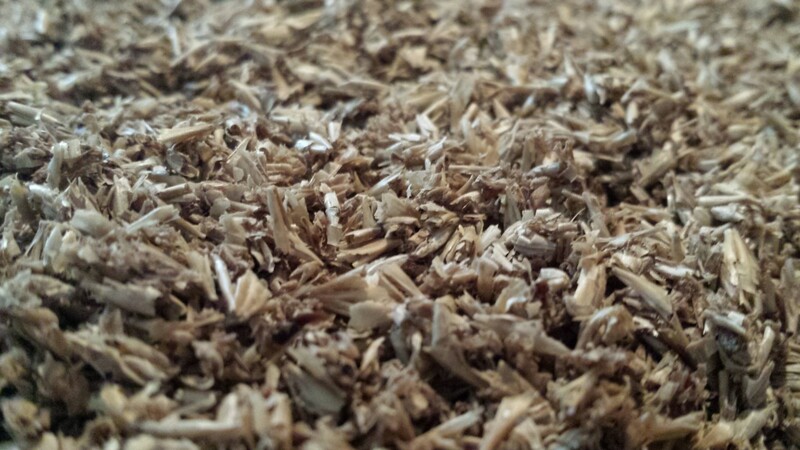 There will be more recipes to come from our remaining spent grains, so I’ll let you know what we create. In the meantime, if you know any homebrewers, check to see if they’d be interested in passing along some spent grains to you and make something out of it — oatmeal, crêpes, bread, cakes, whatever. Yum! Have fun! In a small bowl, combine all of the dry ingredients, including the brown sugar, so that all of the salt, leaveners and sugar are well dispersed. Set aside. In a medium bowl, beat the egg, then mix in the buttermilk and oil. Scoop in the pumpkin puree and incorporate. Add the syrup and honey and give the mixture a few more turns to blend. Into the medium bowl with the wet mixture, add the dry goods and mix only 12 - 15 times (15 for me). As the saying goes, do not overmix the batter. Set aside so that everything can get to know each other. Preheat your oven to 375 degrees. 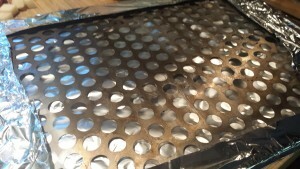 Line one muffin tin with 12 paper cups. 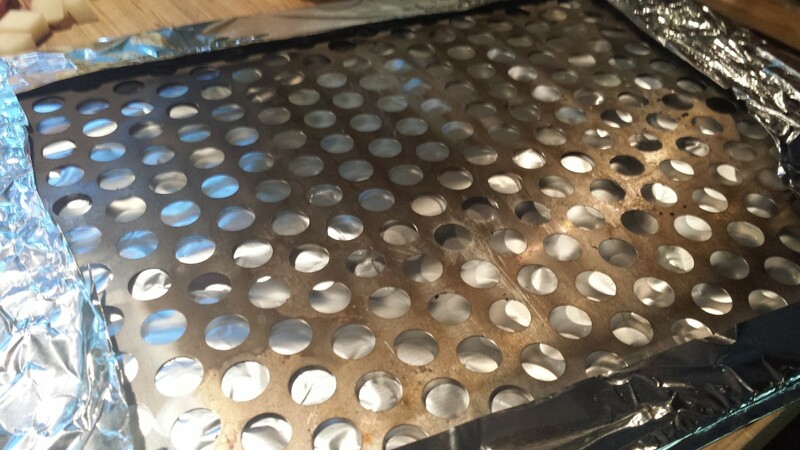 If you are using an RV oven, pull out an Airbake sheetpan or a small sheetpan lined with a couple of sheets of parchment paper to create a buffer between your muffin pan and the gas line. Fill muffin cups about two-thirds full, or the twelve muffin cups equally. Bake for 22 - 25 minutes, doing a clean pick test at 22 minutes. 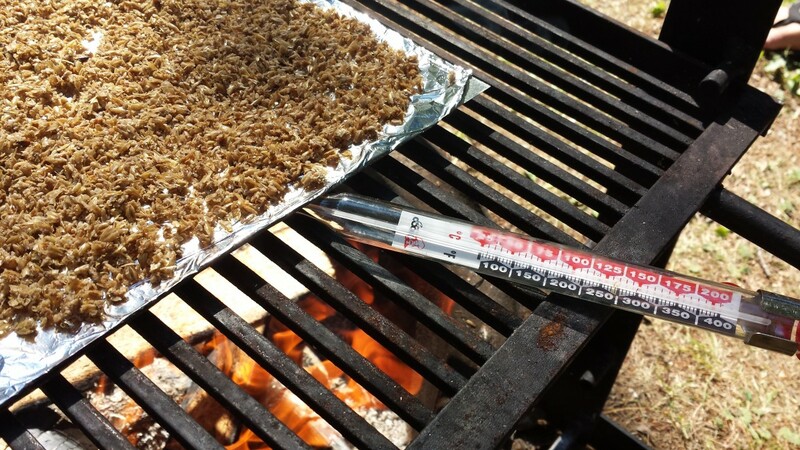 If you are using an RV oven, you will probably need more time, so bake for 25 - 30 minutes, doing a clean pick test at 25 minutes. Adjust accordingly. These muffins taste great with salted butter or with a berry preserve. Scot would like to try them with a jalapeño jelly, so we might be making that in our future, too. Hope you enjoy these.